For plant biology major Abel Walker, one of the most fulfilling parts of attending NC State has been developing his leadership skills through the Caldwell Fellows Program. When he describes his path to the university and the program, it is clear that his potential stood out to many along the way. First, there was the encouragement of his aunt and uncle in Thomasville, who raised him. “They’re very hard-working people. They’re the type to say, ‘You’re going to school if you can.’ They always pushed me,” Walker said. Also providing a strong nudge was Charlene Marsh ’91, who, in addition to teaching chemistry, never missed a chance to talk to her students about attending NC State. Another high school teacher was a former Caldwell Fellow who felt Walker would be a good fit for the program. He hadn’t been accepted to NC State yet, though, and didn’t give it too much thought at the time. Walker researched the Caldwell program after his adviser in the First Year College suggested he should apply, and he found that that it wasn’t what he expected. While strong academic credentials were important, he appreciated the focus on helping Fellows develop into better leaders. Opportunities afforded by the Caldwell Fellows Program take many forms, from attending the Center for Creative Leadership – a Greensboro-based seminar for executives but open to Caldwell Fellows – to solving personal challenges. The Caldwell Fellows Program has also helped Walker challenge his notion of leadership and service. Previously, he defined service through a lens of meeting practical needs. After a project focusing on using local gardens to combat food insecurity wasn’t as successful as he hoped, he realized that education, such as hosting an event on campus to facilitate discussion about hunger, was also an important component of service. A senior, Walker has several ideas in the works for post-graduate employment. He is creating a business plan for a mushroom farm, an idea that grew out of his gardening service projects in the Caldwell Fellows Program. Walker had been hired to grow gourmet mushrooms for vegetarian and vegan dishes in restaurants in the Raleigh area, and he discovered that local chefs in Randolph County have similar needs. 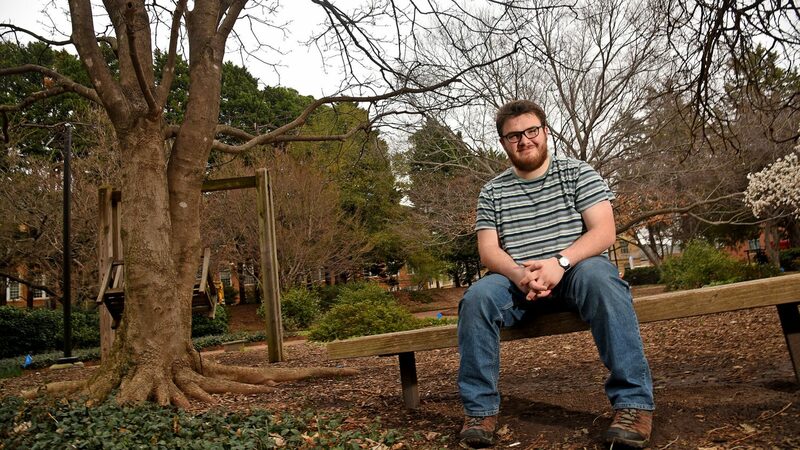 He plans to move back home to start his mushroom business, but in the immediate future, he hopes to work in the biotechnology field in the Research Triangle Park area. No matter what path his career takes, he is confident that his experiences in the Caldwell Fellows Program will benefit him both personally and professionally for years to come.